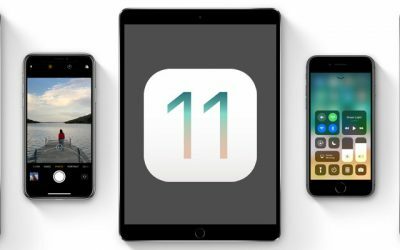 After many months in beta, apple has finally released iOS 11 to the public. There are many new features and options but how many of these will you actually use? When updating to the latest version of iOS you will more noticeably see the changes on the iPad version. This includes the addition of a OSX/MacOS style dock, which can be accessed from within apps by swiping up from the bottom of the screen, so you can quickly change between recently opened apps. This can be seen in the image below, along with the new control centre which has moved to the right-hand side of the app switcher screen. It can be noted that apple allow the control centre section of this screen to be modified slightly, however at present this is not available to be used by third party apps. Another change is the keyboard which now has swipe enabled buttons for numbers and other symbols meaning you no longer have to stop typing to press the numbers button in the bottom left hand side of the screen. Sounds like a little thing that you wouldn’t think you would use, but after using this new keyboard you won’t want to go back! New multitasking interface, you can now drag other apps up from the new dock to the left or right sides of the screen to open them in multitasking view. This is an interesting feature that we have been experimenting with in the office, with varying rates of success. What it allows you to do is share your Wi-Fi password with anyone on your contacts list so long as they are nearby. 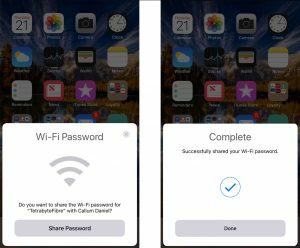 All you have to do to use this feature is have your friend start the Wi-Fi joining process and on your device will appear a popup offering you to grant them access to your Wi-Fi network which is a handy feature. Control centre has also been given an all new look that may take some getting used to, instead of having 3 separate pages you now are presented with one page with all your quick toggles in. Emergency SOS, is a new feature that allows you to contact the emergency services without looking at your phone all you need to do to activate this new feature is press the sleep/wake button 5 times. The phone will then bleep and then give you a 5 second countdown to cancel the call if needed. All these new features are great, however personally I have had a couple of issues since the upgrade, namely issues with bluetooth connectivity with various devices. And on 2 separate occasions I have had my phone freeze entirely for about 2 minutes. Hopefully these are kinks that can be ironed out in a future firmware release.